If we aren't answering your question below or you require immediate assistance, feel free to reach out to us at info@homebethe.com or +91-9265875970 and we will help in any way that we can! Q. What is My Shopping List? My Shopping List is a comprehensive list of all the items previously ordered by you on homebethe.com. This enables you to shop quickly and easily in future. Q. If I pay by credit card how do I get the amount back for items not delivered? If we are not able to delivery all the products in your order and you have already paid for them online, the balance amount will be refunded to your homebethe wallet and you can use it at any time against your future orders. Should you want it to be credited to your bank account please contact our customer support team and we will refund on to your card. Q. Can I add more than one delivery address in an account? Yes, you can add multiple delivery addresses in your homebethe account. However, remember that all items placed in a single order can only be delivered to one address. If you want different products delivered to different address you need to place them as separate orders. Currently our services available for surat And Ahmedabad. Soon we are available in Gandhinagar, Pune , Baroda, Vapi, Rajkot. Shopping at Homebethe brings you a plethora on benefits - delivery times ranging from 9 am - 9 pm, multiple modes of payment, a wide variety of products at one place, a hassle easy return policy and so many more! Don't you want to share these? Oh Recommend Homebethe to your friends today & help them save some time, money & effort. Homebethe offers you multiple modes of payment. You could pay using all major banks credit cards, debit cards or net banking facilities, cash/card on delivery and Sodexo/Ticket Restaurant. Rest assured that our trusted payment gateway partners use secure encryption technology to keep your transaction details confidential at all times. Q. Is it safe to shop using online payment methods on Homebethe? Shopping at Homebethe is completely safe. All credit card and debit card payments on Homebethe are processed through secure and trusted payment gateways managed by leading Indian banks. Furthermore, the banks might ask you to enter an online password (also known as 3D secure password which is available to the card owner only) which acts as an additional layer of security for your card transaction. Rest assured that Homebethe offers you the highest standards of security available on the internet so as to ensure that your shopping experience is private, safe and secure. Q. Can I make payment using Sodexo Meal Passes / Ticket Restaurant Meal passes for Specialty orders? Yes, you can pay for products using meal passes. However, you can pay maximum Rs 1500/- using sodexo on every order and Rs 5000/- every week. If the order amount is above Rs 1500/- than you can pay maximum Rs 1500/- using sodexo and also all other modes of payment are accepted as standard such as Cash on Delivery, Card on Delivery, Online payment by Cards/Net Banking/Wallets etc on above amount. You can pay for your order on homebethe.com using the following modes of payment: Cash on delivery, Card on delivery, Mobikwik, Credit and debit cards , Sodexo & Ticket Restaurant coupon/card on delivery. visit https://www.homebethe.com/mobikwik-terms-conditions for information about mobikwik offers. In order to complete the checkout process and place your order, login to your Homebethe account. In case you are a new user, you will need to register first. To cancel any order, please reach out to our Customer Service team on 1800-120-5606 or info@homebethe.com. We have a no questions asked return policy. In case you are not satisfied with the product received, you can return it with our delivery person at time of delivery . We request you to check all the items at the time of delivery. Products purchased can be returned at the time of delivery only. With a product portfolio that is 16,000 strong and growing everyday, Homebethe boasts of bringing to your doorstep a myriad of products - groceries & staples, fruits & vegetables, beverages, household supplies, personal care products, dairy products, pastas, chocolates, cosmetics, baby products, OTC health care products & so much more! Everything from your most popular household brands to niche products hard to find elsewhere - you name it, we'll have it. Q. What about the products we want but can’t find on Homebethe? We are constantly growing & improving, adding products on a daily basis. If you think there is something we should add to our aisles, all you need to do is use our Suggest A Product feature and we will try to make it available to you in no time! Can't find it? Get in touch with our Customer Service team on care@homebethe.com and they will help you out. Q. Are there any pre-requisites for ordering on Homebethe? To place an order all you need to do is register on Homebethe We do not have a minimum delivery requirement. All orders below Rs.499/- will be charged a Rs.40/- delivery fee in Surat and Ahmedabad. However, feel free to browse the aisles without any conditions. You will also be charged a separate delivery fee for each order as a separate Shopper while be assigned your order. We deliver across Surat, Ahmedabad and Gandhinagar. A delivery fee of Rs 40(Excluding Tax) will be charged for all orders under Rs 499 in Surat and Ahmedabad. A delivery fee of Rs 50(Excluding Tax) will be charged for all orders under Rs 499 in Gandhinagar. Q. What is HBCash? What payment options does HBCash provide? 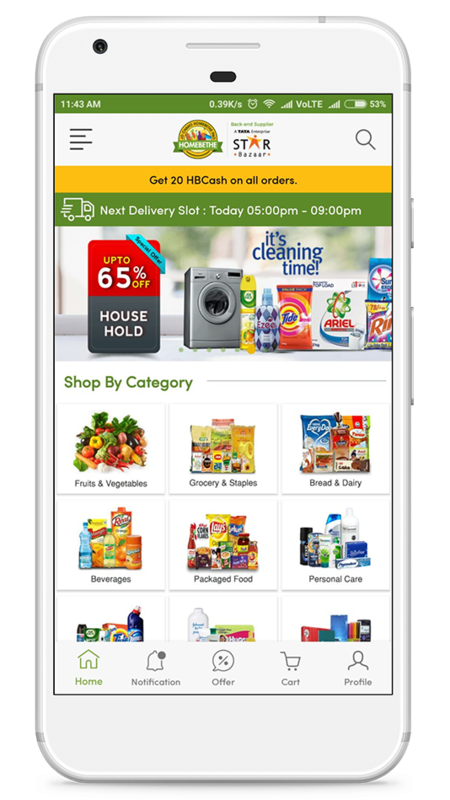 HBCash is digital payment solution. Our goal is to make digital payments so easy and safe that people never have to carry cash or cards again! You can use HBCash as a wallet or directly make transfers through your linked bank account using UPI. It's safe, easy and instant, you have to use it to believe it! Q. Will my HBCash ever expire? HBCash is valid for lifetime. It will never expire. Q. How do I use HBCash to make a payment? At the time of making a payment, you will be able to view the available balance in your Wallet and you can use it for the transaction. You can use only 10% of your HBCash per order. Q. What happens when I return an item purchased using HBCash? Q. What are your timings to contact customer service? Our customer service team is available throughout the week, all seven days from 9 am to 7 pm. Q. How can I give feedback on the quality of customer service? Our customer support team constantly strives to ensure the best shopping experience for all our customers. We would love to hear about your experience with Homebethe. Do write to us info@homebethe.com in case of positive or negative feedback. Q. How do I raise a claim with customer service for any of the Guarantees - Delivery Guarantee, Quality Guarantee?